I took an overnight flight to Sydney, arriving early Friday morning. 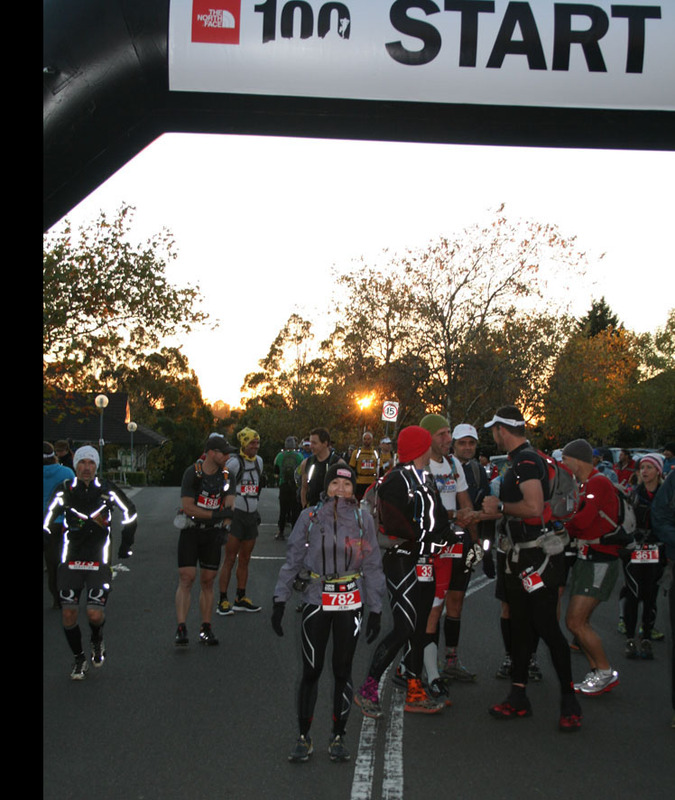 The race registration started at 4pm so plenty of time to get to the Fairmont Resort in Leura, which was the race HQ. I’m still knackered from a long couple of weeks at work and training, and happily manage to sleep through the whole flight. The customs chap looking through the mountain of Hammer Nutrition products in my bag said “Good luck, you’re going to need it .. it’s been pretty cold up there!” when I said I was racing in the Blue Mountains that weekend. Not a particularly auspicious start .. given it was Friday 13th as well! 2 degrees C outside that morning! Happily, I mt Andre and Paper having a coffee in the Arrival Hall. 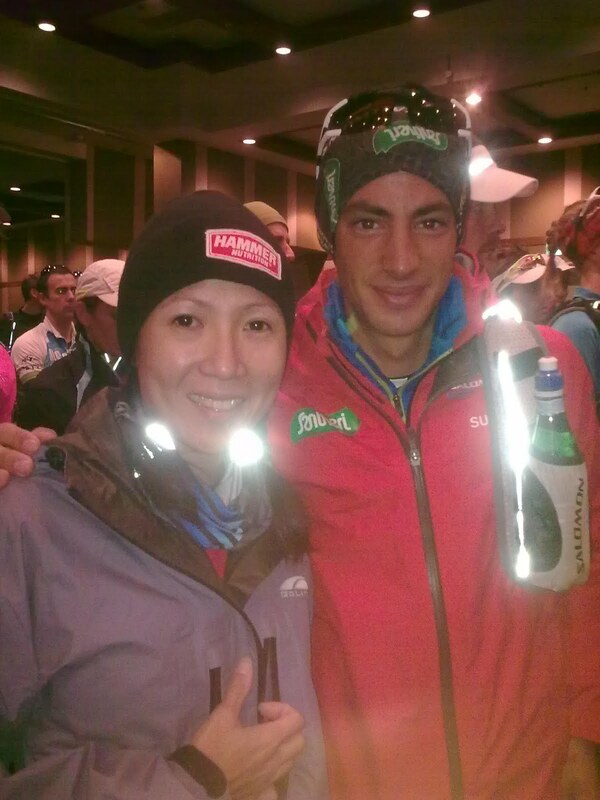 Andre is a HK based runner I met at TNF100 Singapore last year, and this year he’s done the entire Asian TNF100 series so far, including three 100km events in three consecutive weeks. The man’s a machine! Well done, Andre .. I’m still in awe .. Turns out they’re meeting Andy Bowen, a great runner I met at GNW100s last year .. he’s attempting to run across the Nullarbor in August (33 marathons!) so the TNF100 is a mere skip in the park. It Might look messy, but I knew where everything was! Great to see some familiar faces, and this gets me a little more motivated for the race. They head straight to the Fairmont Resort, whilst I go into Sydney to get some last minute kit and meet Buzz Lightyear (aka Keith Hong), who’s giving me a lift up to Leura. Buzz is another awesome runner I met at GNW100s .. and a fellow Singaporean. He’s also the most chirpy, smiley person I know, always ready to lend a hand or give some encouragement. At the Fairmont, the queues are forming for race registration and there’s groups of runners and crew everywhere catching up and talking shop. The registration hall is packed by the time I get in, but the queues for my number and kit check are relatively quick. I find a quiet corner to unload my stuff in order to get my checkpoint bags sorted .. nothing like last minute prep! Finally I’m ready. CP bags deposited, race number collected and kit check done .. time for some shut eye! Buzz sorts me out a lift back to Katoomba (about 5kms away) where I’m staying at a great little guest house called Number Fourteen. Not looking forward to the early race briefing tomorrow! I meet Jane, Blue Dog and Bernadette (more lovely GNW folk) back at the guest house and Jane offers me a lift to race start in the morning. Note to self: next time stay at the Fairmont .. much more convenient if you don’t have a car! Race morning: I am ABSOLUTELY freezing. This is not funny at all. I’m wearing all the compulsory gear (hat, gloves, thermal top, tights, race top, jacket) and my extra fleece and waterproof trousers will be waiting for me at CP4. Okay. It’s showtime. Standing at the start I opt for Wave 2 (estimated 14-17 hours finish time). I’m really not concentrating very well and I figure I’ll just go steady and get home in one piece. Wave 1 with all the elites take off, and when we finally go, all I can think about is how cold I am. 5:14:01 to CP1 at Narrow Neck (18km). The CP was a welcome sight. I topped up my water, tipped some stones out of my shoes (forgot to bring gaiters), grabbed a handful of lollies and carried on down the road. by the time I got to the Tarros Ladder, there was the option of a 5-minute wait to use the ladder (only in place for TNF, so a unique opportunity of sorts), or a 4-minute run on the alternative route via Duncan’s Pass to get to the bottom of the ladder. Ordinarily I would have waited, but I was still freezing and would have gotten much worse if I’d had to wait around for 5 minutes. I did enjoy the detour, though .. at least it kept me moving! My progress getting slower and I’m definitely not all there. I’m weaving all over the track and knackered beyond my usual fatigue. I’m guessing it’s a combination of cold and sleep deficit. A long steep descent after Mount Debert reminds me of the mudslide we had in Sabah a couple of weeks ago .. except this time it’s dry and loose, but just as steep! 7:56:33 to CP2 at Dunphys Camp at 38km, and I try to make it a quick stop. Freezing fingers don’t help and I have to take my gloves off to top up my water. Stone removal, handful of lollies, and we’re off. Met a Singaporean lad doing his first 100km, didn’t quite catch his name, but we kept pace for a bit. It’s tough terrain to CP3, and I started to flag when we get to Iron Pot Ridge, feeling extremely sleepy and cold. The stick players at the end of Iron Pot Ridge were a nice surprise and provided great atmosphere though! On the way back from the ridge I tripped and fell hard. This was my fourth fall and I’d landed on the same spot on my right knee for the third time. I rolled off to one side of the track to recoup and wait for the pain to subside. Each time I fell, every passing runner offered a hand. This time was no different and I’m cheered by the camaraderie at these events. I get back up and limp along for a bit till the pain subsides enough to run and just try to make it to CP3 in one piece. I meet some lovely people along the way, one of them being Dave the Paramedic, who’d doing TNF for the second time. He’s great to chat with and helps me take my mind off the fact that I’m really not enjoying this as much as I hoped I would. We must look funny together .. I’m completely wrapped up with gloves and hat and warm clothes while Dave’s in t-shirt and short shorts! 8:13:19 at CP3 (The Six Foot Track – 54km), and it’s nice to see Tall Geoff there (we ran most of GNW together), and he takes it on himself to make sure I have everything I need before setting off. Geoff’s done this before in a very good time, so I take his advice and encouragement on board. Not far to CP4, just 11km. He forgot to add it’s ALL uphill! By this time my jacket is back on as well. The weather’s turned cold and I wish I’d put my fleece and trousers at CP3 instead. Half a mile out of CP3, I trip and fall again, this time coming down hard on my hip and elbow. I lie on the ground for a few minutes, waving off concerned runners .. I worry I’ve broken something until the pain eases off .. NOT having fun here! I get up and plod on through Nellies Glen, and by the time I start the ascent up The Six Foot Track I’m really freezing. I haven’t taken my hat and gloves off since I started and I’m wearing every item of clothing we’re meant to carry. Halfway up the long, steep climb I pass a chap sat with his head in his hands on the side of the track. I know how you feel, mate. I offer some encouragement and he wearily gets up and continues his ascent behind me. Sometimes you have to draw strength from others. Give what you can. Knowing he was plodding on behind me gave me a little more strength to keep going. Thanks, mate. Two cups of tea, two bowls of noodles, and nearly an hour sat under the heater later … I’m still cold. This is despite having had heat packs in my hands as well. I wasn’t mentally prepared for this and my brain’s decided to shut my body down. I’m still weighing my options and Geoff’s been patiently sat across from me the whole time. Bless him. He says its a couple of hours downhill then another couple steady walking uphill. Not sure how accurate that would be given my current state but it sounds achievable. Just not very appealing. I see-sawed between wanting to finish and throwing in the towel. I’d spent the last hour trying to warm up without much success. Going out now into the dark, going bush and downhill would definitely render me cold beyond despair. This wasn’t a main race for me. I’d signed up to get more challenging terrain for UTMB training. I’d never DNF’d before. I didn’t want to DNF. But I didn’t want to be out there for another 10 hours either. Or have a fall in the dark. Finally, after much deliberation, a little advice from Geoff and the Desert King, I decided to call it a day. I went over to sign my name on the withdrawals list and took small comfort in seeing the previous three withdrawals had all listed their reason for DNF as ‘freezing’. No drama then. Once I’d actually made my choice, I didn’t have any regrets. Live to race another day. I needed to go back ready for more hard training, not having to be nursed back from the brink of hypothermia. Geoff very kindly drove me back to Number Fourteen. I sat in the long bath in some lovely hot water and felt the sensation come back slowly to my finger and toes. Definitely no regrets. I was in bed by 8pm and glad of it. I did feel some small regret the next day at prize-giving though .. like I didn’t quite belong because i hadn’t finished. But it wasn’t a big deal and it was good to see the Salomon Team sweep the podium, with Kilian smashing the men’s record. Julie Quinn was the only non-endorsed athlete on the podium, beating her own record from 2010 to take first place in the women’s race. I’ll add the official pics when I get round to downloading them .. think it’s time to get a new camera .. my poor little compact has definitely seen better days now! Love your post, and your blog! Sorry the freezing cold took some of the fun away though. How cold was it? Cheers! Just wanted to tell, the French guy on the photo at the top is Sebastien Chaigneau, and he never won UTMB; he was 3rd in 2011 though. 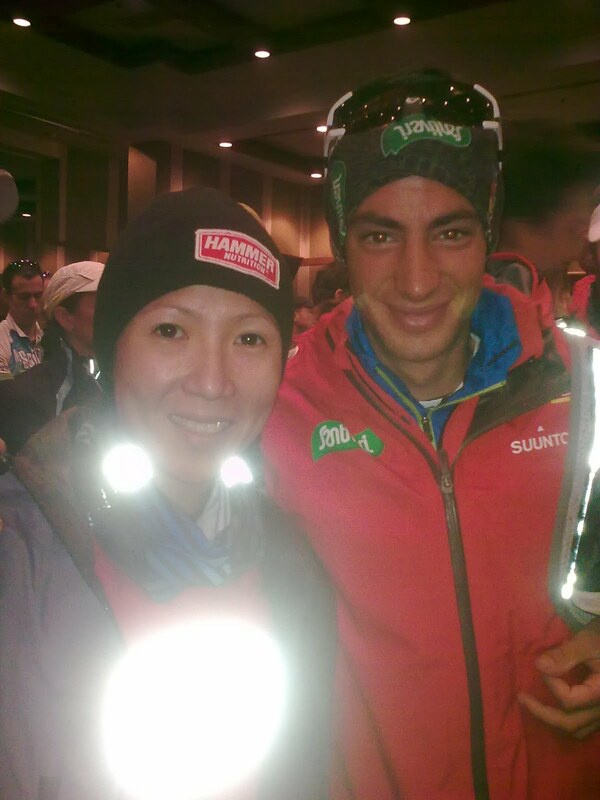 UTMB 2009 was won by Kilian Jornet.